I have not an in depth employment report since looking at October [Nov 7: October's Unemployment Rate Rises to "6.5%"] so for long time readers the main numbers are 8.5% (U-3) and 15.6% (U-6) and 20%ish (Shadowstats). You can skip the rest of the entry which explains the normal spiel to newer readers about what exactly is going on behind the subterfuge. As always, warning - this is a long post. The U.S. unemployment rate jumped in March to the highest level since 1983 as the economy lost 663,000 jobs. The jobless rate increased to 8.5 percent from 8.1 percent in February. Employers have cut a total of about 5.1 million posts since the recession began, the biggest slump in the postwar era. Workers’ average hourly wages rose 3 cents, or 0.2 percent, to $18.50 from the prior month. Hourly earnings were 3.4 percent higher than March 2008. Second, let's begin by saying the job losses are huge - another month of > "650,000". I always put that data in quotes because (a) as you will see below its adjusted upward by government statistician guesses and (b) it's been revised downward constantly 1-2 months after the fact. We've really been losing upwards of 800,000 jobs a month for much of the past 4-5 months. Now, the stock market does not care because it is backwards looking. We have to look forward. Will this number improve? It has to eventually - the pace we are going is unprecedented. Even adjusted for population growth (i.e. 650,000 lost jobs now is not "as bad" as 650,000 lost in the 1960s due to population increases) this series over the past half year is as bad as the worst of the early 1970s (as a % of population). That time frame has the worst 1 month job losses as a % of population so we are matching that by OFFICIAL numbers and beating it by REAL numbers. So the bulls rightly say this number will improve - it has to. Look for job losses more on the order of 200k-400K/mo as we move further into summer. We will "celebrate" those numbers as "2nd derivative improvements" and "the tide has turned". Going off my double dip recession forecast combined with "jobless recovery", with the tsunami of government dollars we might even have 0 job loss months by the end of 2009. But by that point we'll need to find 8M+ jobs to offset what we have lost. But it is now official, we have worst official data than the depths of the job losses in the late 70s and early 80s. (10%ish) Only it won't be reported that way; but below is the reality check. Let's go on to our normal nitty gritty - let's begin with the data from Shadowstats.com showing you the trend - let me explain the data points. This chart shows our government figures (today) versus how they would show if we used methodologies we used to use when we actually told the truth to our people. You might ask how I got to 12.5% when the official number is 8.5%? The SGS Alternate Unemployment Rate reflects current unemployment reporting methodology adjusted for SGS-estimated "discouraged workers" defined away during the Clinton Administration added to the existing BLS estimates of level U-6 unemployment. For those not familiar with the gamesmanship here, the government (Clinton era forward) began making "adjustments" to the data to make it not quite so stinging. It was somewhat humorous when unemployment was officially sub 5% (but not really), but now in the depths of a brutal recession it's more along the lines of an egregious obfuscation. So to be conservative and to get to my 12.5% I am going to add together the official 8.5% to the variance between the SGS Alternative and U-6. (4%) = 12.5%. That 4% is what the government has wiped away over the years - discouraged workers aka people who have given up. Because in America after a specific period of time of being unemployed ... well you are no longer unemployed (believe this is 4 weeks of top of my head). See how it works? This is why we sometimes see data where the # of employed people falls but the unemployed rate doesn't rise in the same ratio... people who have given up for a certain period of time have disappeared into the ether and no longer count. So in this economy when finding a new job is taking much much longer than many post war recessions, that gap should only widen from here - meaning the gap between how we used to measure unemployment and what you will hear, will only widen. What does that mean? It means a good portion of 170,000 people gave up - employment dropped 861,000 but unemployment only increased 694,000. Did all the people in that variance give up? No - some of might of went back to school, or some women had babies and dropped out of workforce permanently - we don't know. But these are the people the government no longer counts as unemployed. A more liberal application would say 20% is the true unemployment rate - this adds U-6 (underemployed people) + the discouraged workers but I am going the conservative route - although I believe the truth lies somewhere in between 12.5% and 20% .Again this is roughly 2% above the worst times of the 1970s and early 80s (if you are under 30 ask your parents). And we have much more to go in the months ahead. So as you hear "unemployment at 25 year high" - that's not reality; if we had kept consistent measuring similar to how we measured pre early 90s - this is the worst post World War II unemployment period. I've been struggling to think of a term for all these people who are struggling with part time work, working 2 jobs, or in contractor jobs where they get hired/fired on a daily whim ( I call them "nomad workers") This is a systematic and secular situation - nothing to do with 1 month's report or another. It is part and parcel with the erosion of living standards - and why so many in the middle and lower economic strata turn to home equity, credit cards, etc to just get by. It is worth reading that whole entry if you are new; but the key thesis is many are struggling with multiple part time jobs or working in jobs they are over qualified for but need money to make ends meet as we move away from a "production" society to a "service economy" (you do my taxes, I'll cut your hair, she'll walk my dogs, he'll serve me a burger) as our multinationals move jobs away to cheaper labor pools. I want to stress this is a a STRUCTURAL change to the economy, not simply due to the recession. It is only now being exposed as more and more are being faced with it, higher up the socio-economic food chain. These people make up the difference between U-6 and U-3 above. Next, we have to show new readers the ludicrous birth/death model - you can read about it in detail here [Jan 27, 2008: Monthly Jobs Report & Birth/Death Model] You should read this whole post as well if new to "U.S. Government Statistics" but in summary this represents new business formation (or closing) in America - a guesswork. It is "fine" when the economy is generally trending slowly in one direction but terrible when we have changes in directions. And it has been manipulated like mad - over the past 1.5 years the government has been filling this data point with "new businesses/jobs" created in construction, financial services, manufacturing, etc. How is that possible? It's not - but that's what you can do when part of your official report is guesswork - you can put whatever number you want in it. We have more on this later in the post but by creating new jobs in new businesses - the number is understated EVEN further. We have 2 huge beaurocracies - federal government and healthcare. To keep the government from going even more insolvent we should in theory be cutting jobs from these 2 white elephants. Healthcare costs spiral out of control and we hire more people - I believe healthcare is now 16% of GDP. But how do you cut costs without cutting jobs? 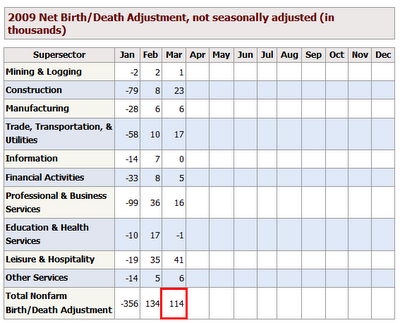 Thats the other dark secret - most of our recent gains in jobs are either government or healthcare related. So how do you fix the long term problems in either? Chicken or egg? They are sapping our national wealth away by their huge excesses/costs BUT they also provide the main job growth as well. As with everything my expectation is the "kick the can down the road" theory will continue - keep growing these massive bureaucracies (create more jobs and costs now) and let another generation pay for it. Government payrolls decreased by 5,000 after a gain of 3,000 the prior month. It is now so bad, that despite the federal government increasing jobs at a furious rate as they do every year, state governments FINALLY cut more to offset the federal government. But I'd expect this to reverse soon enough (which will create "good job reports" in the back half of 2009) as we create false prosperity. Taking money out of your pocket to subsidize job growth - since the broken, over levered, service economy can't do it anymore. Below this I will copy Mish Shedlock's comments - he still has the energy to look at the fictitious details and break them out; I've long gave up on the exercise since "garbage in, garbage out" is my assessment. Just remember, the stock market is not the economy - Main Street is not Wall Street. Oops, everyone says Wall Street is Main Street as long as it pertains to why you need to bail out Wall Street. Ok, that relationship does exist - but only when it comes to bailouts... otherwise Main Street is not Wall Street and the pain on Main Street can be wiped away as we look forward to great times ahead. Soon the time comes when the country is filled again with federal government jobs (that money came from where?) and federally subsidized state government jobs . But just remember - this is now the worst employment situation we've had since the Great Depression ... although most talking heads simply are not rigorous to figure it out. A total of 305,000 goods producing jobs were lost (higher paying jobs), and the service sector was clobbered once again as well. Government lost 5,000 jobs, a welcome event, but I expect this to change in the months ahead along with various stimulus programs. It was nearly a clean sweep this month. 8,000 education and health services jobs were the only gains for march. .... the Birth/Death numbers are back in outer space.... At this point in the cycle birth death numbers should be massively contracting. Month after month, with the exception of January, the BLS is assuming more jobs were created by new businesses than lost by businesses closing shop. The BLS model is horribly wrong. The official unemployment rate is 8.5% and rising sharply. However, if you start counting all the people that want a job but gave up, all the people with part-time jobs that want a full-time job, all the people who dropped off the unemployment rolls because their unemployment benefits ran out, etc., you get a closer picture of what the unemployment rate is. That number is in the last row labeled U-6. It reflects how unemployment feels to the average Joe on the street. U-6 is 15.6%.